Summary for the Busy Executive: A far piece to go for mighty little. In 1928, engineer and cellist Maurice Martenot premiered a new electronic instrument – the ondes Martenot. To some extent, he viewed it as the next generation of theremin, an instrument clumsy in virtuosic music. The ondes could execute rapid, precise note changes as it maintained the "infinite" portamenti – the swoops and slides – of the theremin. French composers in particular went crazy for the instrument. Varèse (OK, not, strictly speaking, French) authorized its use in Amériques and in Ecuatorial to replace the sirens. Honegger thought it an acceptable alternative for a double bassoon and wrote a striking part for it in his masterpiece Jeanne d'Arc au bûcher. Messiaën wrote a lot with the instrument in mind, and with major works like the Turangalîla-symphonie and 3 petites liturgies de la présence divine, he is likely the composer most closely associated with it. Both the theremin and the ondes, however, are monophonic instruments (essentially, melody only). With today's samplers and synthesizers capable of many more sounds and multiple voices, the ondes may be on its way out (once we get rid of our Historic Instrumental Performance ideas as applied to Modern music). Production ended in 1988. Most of this program I have no wish to hear again, – just not worth my time to talk about it, other than to recommend it to insomniacs. Some of it is pleasant enough, like the Bloch Formule (an update of the Widor toccata), and the Wisson Kyriades, three movements for orchestra and ondes, a rhythmic showpiece. Incidentally, the name "Bloch" seriously misled me, since I thought it was my hero Ernest Bloch. 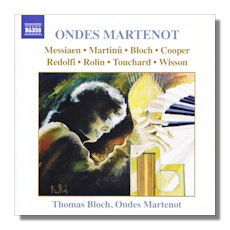 This Bloch turned out to be Thomas, an ondes virtuoso and composer. He studied with Yvonne Loriod, the Landowska of the instrument, a.k.a. Mme. Messiaën. He also plays the glass harmonica. Messiaën and Martinů supply the disc's raisons d'être. I find them the only two works on the program that treat the ondes as a musical instrument, with its own characteristics, to be sure, but no odder than a clarinet. They interest themselves in the musical – as opposed to the physical properties of the instrument. You believe in the ondes's ability to integrate with other members of an ensemble. Feuillot d'inédit #4, a brief Impressionistic bonbon, consists of gentle ostinatos supporting a melody made up of very long notes – one of those Messiaën adagios that suspend time. However, the Martinů Fantaisie of 1944 rates as the real star on the program. The composer wrote it for a Massachusetts neighbor lady of his who played the theremin. Because the part proved difficult, he switched out the theremin for the ondes. The Fantaisie – a septet for ondes, oboe, piano, and string quartet – is a large A-B-A form beginning with a slow, lyrical introduction featuring a gorgeous duet between ondes and oboe. Incidentally, the ondes in this work sounds like a recorder with a wide range and power when necessary. As it proceeds, it intensifies. The stress dissipates, as the first part leads to a slightly faster, light polka, of a type well known to the composer's fans. A gorgeous radiant climax moves to a real allegro and greater tension, which suddenly disappears in favor of a glowing chorale. Things turn melancholy briefly and then, on a dime, back to happiness. The first part comes back, with that joyous ondes-oboe duet, and the music gradually winds down and out. I know so little about the ondes and have heard so few ondistes that I couldn't tell you how well Bloch does. I can say that his fingers fly in the fast numbers and that he's a fine partner in the Martinů. For me, that number alone was worth the price of the CD.